British Conservative politicians have been booed at the Paralympics in London amid protests against cuts to disability benefits. The government has faced heat for awarding Paralympic Games sponsors Atos a contact to carry out “fitness to work tests” on people on incapacity benefits, which opponents claim has driven disabled people to poverty and even suicide. Atos Healthcare, a global IT company, was given the £400m (NZ$796m) contact at the beginning of last month. The British government claims more than £600m (NZ$1.19b) each year is being spent on overpayments to people who no longer qualify for the level of benefits they are receiving, the BBC reports, and so is now basing its payments on the Atos Work Capability assessments. However, action group Disabled People Against The Cuts says less than 0.4 per cent of incapacity payments are fraudulent, but the government is looking to cut spending in the area by 20 per cent. Opponents to the assessments say more than 1,000 people who had their benefits cut as they were deemed fit work subsequently died last year. DPAC’s Roger Lewis told the BBC the assessments were causing “huge damage and distress to disabled people”. Last Friday saw a large protest at the Atos’s London headquarters, as well as a demonstration at the Department for Work and Pensions, also in the capital. Both Prime Minister David Cameron and Chancellor of the Exchequer George Osborne have now been loudly booed by crowds at Paralympic events. Cameron received his negative reception when he was shown on the big screen at the Aquatic Centre, while Osborne was on the end of deafening disapproval at a packed London Olympic Stadium as he was announced to present the medals for the 400m T38. Not all UK politicians have been booed by Paralympic crowds, with former Labour Prime Minister Gordon Brown receiving a “rather contrasting reaction” as he presented medals at the swimming, the Guardian reported. It is not clear if the reception for the Conservative MPs is related to the Atos contract, or simply a reflection of the slumping support for the Tory-led Government in the polls. British paralympians have also spoken out against proposed cuts to the disability living allowance, telling the Guardian that without benefit they would not have been able to participate in society, let alone sport. “Without DLA I would not have been able to do what I did or be a top athlete,” Ade Adepitan, former-Paralympic wheelchair medallist told the paper. Athletes also hid their security pass lanyards, which bear the Atos logo, during the opening ceremony to the games, however ParalympicsGB rejected this was a protest, rather claimed they had been tucked under their uniforms as it was windy. 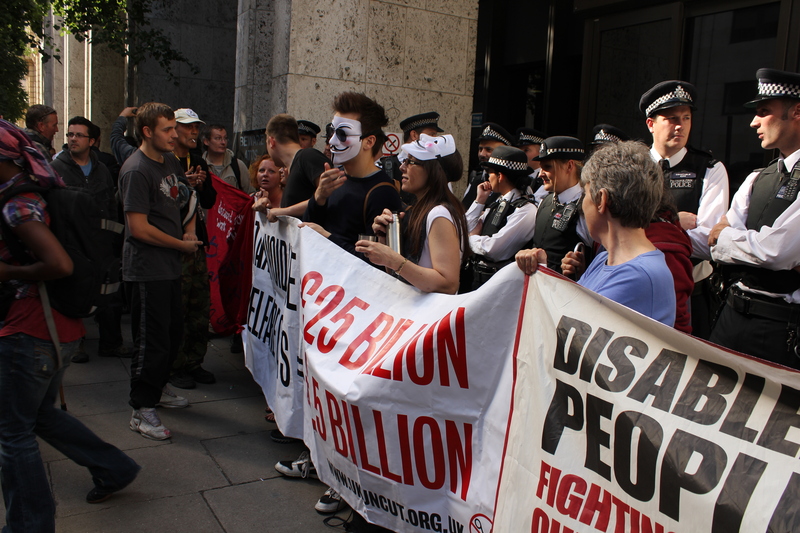 The Paralympic sponsor Atos has been targeted by disability and anti-cuts demonstrators in angry protests at its role in testing disabled people to reassess their eligibility for benefit payments. Hundreds of disabled and able-bodied protesters chanted outside the IT group’s central London headquarters, before moving to the Department for Work and Pensions (DWP) in Westminster, the government department in charge of the scheme. There were minor scuffles with police after a small number of protesters occupied the lobby and attempted to blockade the department’s front entrance. Atos has been the focus of fierce controversy over its sponsorship of the Games while contracted by the DWP to carry out “fitness to work” tests, which campaigners argue are part of a money-saving drive to reduce benefit payments. Atos, she said, was “an agent of a policy that has already driven people to suicide and even those it hasn’t, has added such hardship and fear and uncertainty and insecurity to the last people who need to be feeling that”. Atos Healthcare, a subsidiary of the French IT multinational, is contracted by the DWP to carry out “work capability assessments” of people receiving incapacity benefits, in which they are scored on whether assessors judge them able to work. But campaigners say many of those whose benefits are slashed or removed remain incapable of holding down a job, citing research showing that, during one nine-month period last year, 1,100 people who had been judged able to work and had their benefits slashed accordingly had died. Some 40% of the 738,000 assessments carried out last year were appealed against, of which 38% were upheld. Several people at the protest cited the case of Cecilia Burns, 51, from Strabane, Co Derry, who died this week from breast cancer despite being told in February that she was well enough to get a job, after which her employment support allowance was reduced to £30 a week. After a campaign her benefits were reinstated a few weeks ago but she died on Monday, the BBC reported. Claire Glasman, from north London, said she felt that “disabled people are under the harshest attack that we have faced since the welfare state was set up”. She described the results of the tests as “a humanitarian disaster” and said that disabled people were feeling increasingly desperate after lobbying parliament and MPs without significant results. “It’s just an absolute crisis. You can see we are just at the end of our tether,” she said. The comedian Jeremy Hardy said he had attended the protest because “I just think the way the coalition has decided to victimise people with disabilities is so blatant and shameless, and they are willfully creating a new stereotype and a new scapegoat, suggesting that hard-working people’s money is being siphoned off to the undeserving. 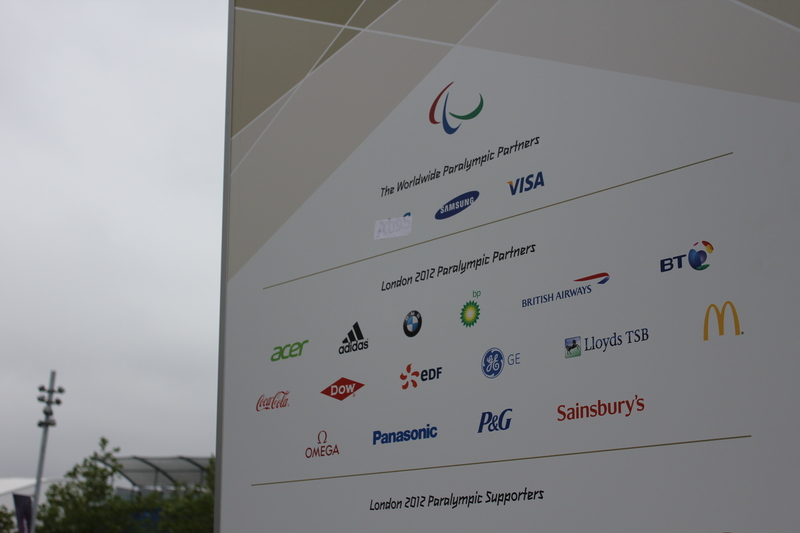 On Thursday, ParalympicsGB officials denied British athletes at the Games had hidden their accreditation badges at the opening ceremony, after observers noted that none was displaying the lanyard that bears the sponsor’s logo. In a statement, Atos said: “We fully respect people’s right to peaceful protest and we understand this is a highly emotive issue. “We do not make decisions on people’s benefit entitlement or on welfare policy but we will continue to make sure that service that we provide is as highly professional and compassionate as it can be. We do this through a constant program of training and education for our staff, a rigorous recruitment process for healthcare professionals and through continual work with the government, disability rights groups, healthcare professionals and those going through the process on the ground. ‘The government’s decision to crack down on the disabled takes a bizarre turn this week after a man in a coma was stripped of his benefits – because he’d not handed his fitness-for-work questionnaire in. Client’s husband is in hospital in a coma. He was sent ESA501. The decision is part of a lengthening list of seemingly nonsensical judgements handed down by ATOS healthcare since it was appointed to oversee benefits claims in 2005 – another notable case is that of Larry Newman, who was told to stop slacking and get back to work despite having an incurable lung disease, which killed him just months after his assessment. Disabled People Against Cuts need your help and support! Visit DPAC on facebook to receive updates of information and events and stop ATOS ruining peoples lives and getting away with murder! We are coming after you ATOS. In Parliament, in the Courts, online, and on the streets…LET THE ATOS GAMES BEGIN!! !